We meet at your place in order to make acquaintance with you and your dog and discuss your pet’s needs. This first meeting is of course free of charge. We will ask you for your companion’s passport, your vet’s details and a set of keys if necessary. We then sign a service agreement. We pick your dog up at your place, drive him to the woods and bring him back home after the walk. The professional insurance covers any damage your dog might cause. In case of an emergency (sickness or accident) we contact your vet or any trustworthy professional we recommend. Our vans are designed to give your dog extra comfort ; water and a first-aid kit are with us at all times. We briefly clean your dog up if he gets wet or muddy. We take your dog out no matter how bad the weather is. 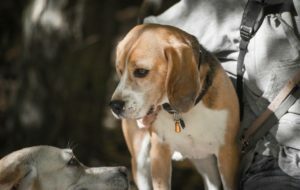 Your dog must be chipped, vaccinated, properly socialized (non aggressive towards other dogs, kids, joggers, bikers), and have a good call back. MINIMUM 2 WALKS A WEEK.